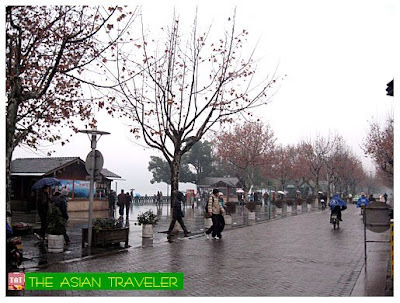 After the Lingyin Temple tour, hb and I decided to go to the famous West Lake, which has been an attraction for centuries in Hangzhou, China and was once a favorite imperial retreat. It covers an area of 60 square kilometers and it is surrounded by hills on three sides and faces the downtown area on one side. 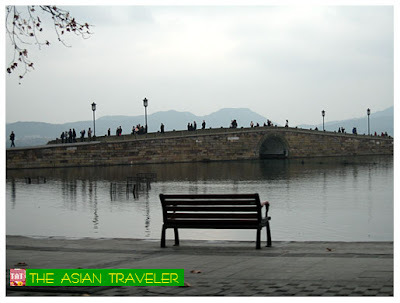 There are many attractions, historic sites, stone bridges, dense foliage and a number of pagodas around the West Lake. 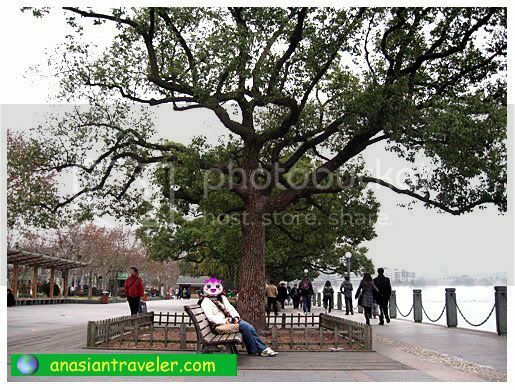 The West Lake came from a shallow bay in ancient times where Qiantang ran into the sea. 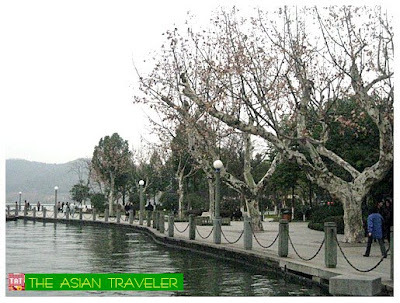 It was formerly named as Wulin Waters, Golden Buffalo Lake, Qiantang Lake and Xizi Lake. 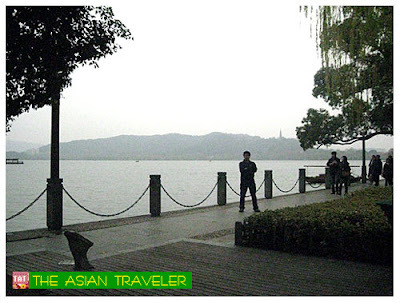 But it was later named the West Lake as it lies in the west of Hangzhou. 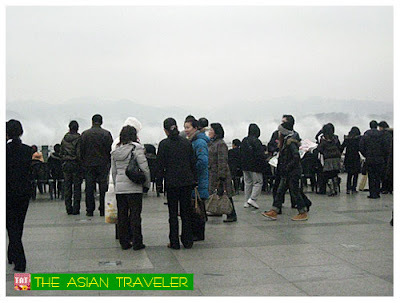 As we walked around the beautiful promenade at the Hubin Road side, we first spotted a large crowd of onlookers gathered around near the perimeter of the fountain. As we got a closer view, we could see the colorful beams of light and synchronized dancing water fountain where it changes its position high above the ground. 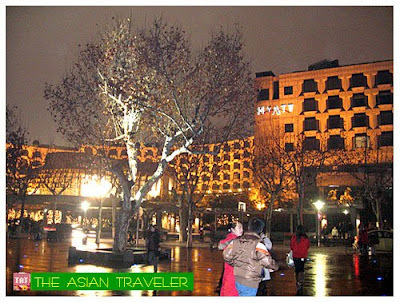 The large musical fountain is 126m long at Hubin. This show is fine-tuned to be a crowd pleaser. If you're early, you can grab a seat here for free. I'm not sure if the show only runs on weekends. We saw the musical fountain twice on Saturday night and Sunday afternoon. The West Lake can be enjoyed in many ways. 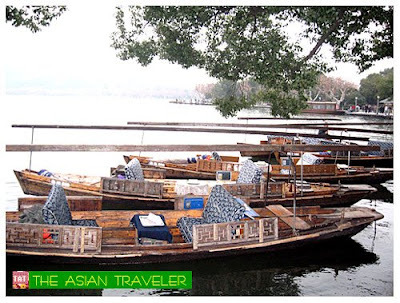 There are cluster of boats available dock at the park that offers a brilliant opportunity to get a closer view and nice vista of the lakeside scenery or to go to the three Islets. Sadly, we didn't try the boat ride as the cold weather wasn't perfect for an aquatic adventure. Hb even jokingly said, he might die immediately on being immersed in near-freezing cold water before he gets drowned. :) Ticket price is around 45 Yuan per person (rate as of Dec. 2008). There are also some small boats where I think you can negotiate the price with the rower. 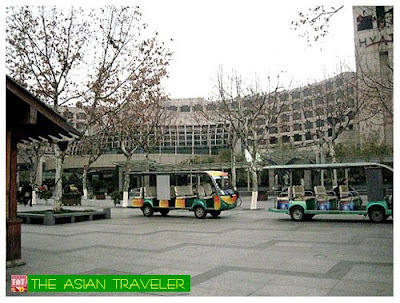 You can also try the round-the-lake sightseeing Golf Cart which is fast, convenient and easy to travel around the West Lake. 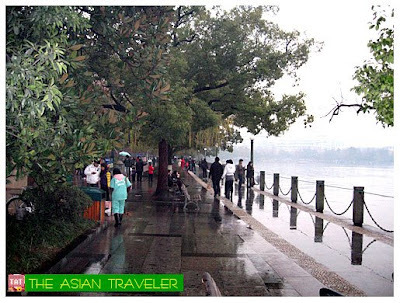 Taking a stroll along the huge promenade, we enjoyed seeing the splendid scenery of the famous West Lake. 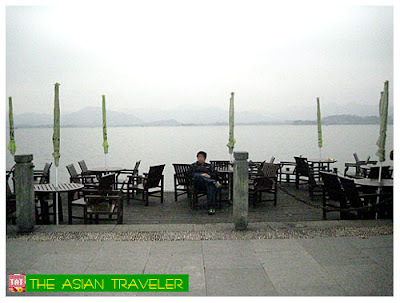 Looking out onto an inviting West lake scene invoked a sense of sublime calm and relaxation for us. It was also a great way to get some exercise and burned some extra calories. :) There are some picnic tables and chairs right next to the water and several long wooden benches set up at designated areas. 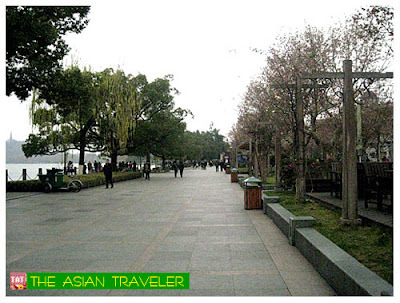 With so many points of interest in the West Lake, how do you know which ones are the best? Just to give you an idea, here are the top ten scenes of the lake such as the Spring Dawn at Su Causeway, Breeze-ruffled lotus at Quyuan Garden, Autumn Moon over the Calm Lake, Lingering Snow on the Broken Bridge, Viewing Fish at Flower Pond, Orioles Singing in the Willows, Three Pools Mirroring the Moon, Twin Peaks Piercing the Cloud, Evening Bell Ringing at Nanping Hill and Leifeng Pagoda in Evening Glow. But please keep in mind that some of these attractions are seasonal. Su Causeway is a boulevard almost 3km long. 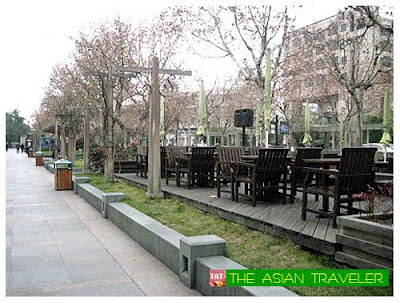 It is north-south causeway that starts by the Shangri La on Beishan Road and goes all the way down to Nanshan Road. 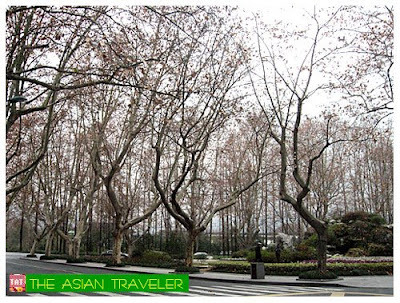 Since the West Lake itself is very large, make sure you set aside one whole day if you're planning to explore the whole scenic area. 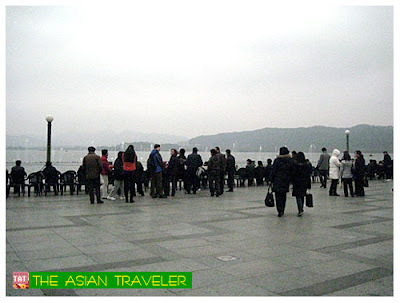 During our visit, sightseers are mostly locals and tourist from mainland China. Beautiful photos! I missed Hangzhou when I went to Shanghai last time. Will have to make sure I get there when I go to China next.